Craig Harrison hopes to complete a full set of deals with out-of-contract players by re-signing Brad Walker before the end of the week. The Hartlepool United boss was thrilled to get Rhys Oates to put pen to paper yesterday on the first day of pre-season training. It followed on from the new deal signed by defender Carl Magnay earlier this month. 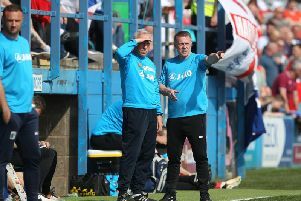 Oates was at Durham yesterday with the majority of the Pools squad being put through their paces by Harrison, who was assisted by two members of his new-look backroom staff, first-team coach Matthew Bates and goalkeeping coach, Bernhard Hirmer. Harrison was therefore delighted with his day’s work. “Definitely, without a doubt,” he told SportMail. “I’m very pleased Rhys has signed his new contract. “I never really wanted to lose anyone and I spoke to Trevor (Carson) when I came to the club. “His situation was a little different, he was under contract, and we received a transfer fee for him. “But Mags, Rhys and Brad were all out of contract. “Rhys I’m pleased to say has decided to stay to have a go at getting us back in the League as soon as possible. Harrison said the opening day was “perfect”. The squad, originally, were not due back in until Friday but the 39-year-old changed the start date, meaning some players missed day one. “I moved the schedule forward to get four extra sessions in. “The day went very well. “It’s nice to see people face to face and start to build relationships. In bygone years, squads returning to pre-season training would traditionally receive a “beasting” as coaches removed any excess pounds put on by the players during their summer break. A football was rarely seen in the opening week but these days players receive fitness programmes at the end of the season to ensure they are not out of shape for their return to work. That means a manager can begin to focus on skill as well as fitness. “There is a bit of a mix of running and ball-work,” said Harrison.